Global chemical industry sales are around $3tn a year, close to 5% of global GDP. They are even larger when converted into all the products that we actually use on a day-to-day basis such as plastics, coatings, fibres, agrochemicals etc. 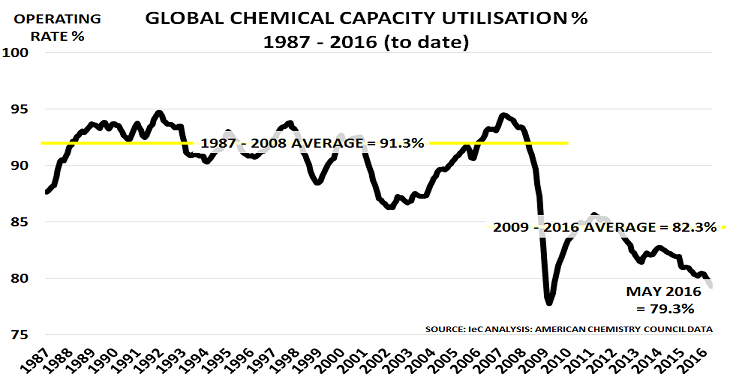 And thanks to the American Chemistry Council, we have near real-time data of core trends such as capacity utilisation (CU%). This is why the industry is the best leading indicator that we have for the global economy. The drop is even more worrying when one remembers that consumers have generally been building inventory over the past few months – seeking to buy forward ahead of price increases caused by the rising oil price. Without this support, the CU% would presumably have been even lower. And of course, the unwinding of this inventory will now have a negative impact on CU% in H2, unless the oil price rises further for some reason. The key question, of course, is whether H2 sees any improvement? This seems unlikely following the Brexit vote, which is already having an impact on confidence within and outside Europe. Plus there is the uncertainty over the outcome of the US Presidential election, which has clearly set nerves on edge around the world. This is the New Normal world, unfortunately, where political and social issues assume equal or even greater importance than economic issues. It is very hard to adjust to these changed priorities, particularly as the pace of change keeps increasing. Who would have thought a year ago, for example, that in the UK both major political parties would now be holding leadership elections? Or that a man of the moment would be Nigel Farage of the UK Independence Party – who had failed once again in May 2015 to win a seat in Parliament? Truth is indeed proving stranger than fiction. And who knows what shocks are yet to come, as we move into H2?